After growing herbs, growing zucchini and other summer squash is about as easy as it gets for gardeners. Zucchini can grow in just about any soil, and produce even when neglected. Zucchini are a specific type of summer squash, and share the same soil, water, and cultural requirements as other squash. See Growing Squash for how to grow zucchini and other squash. Waiting too long to harvest. 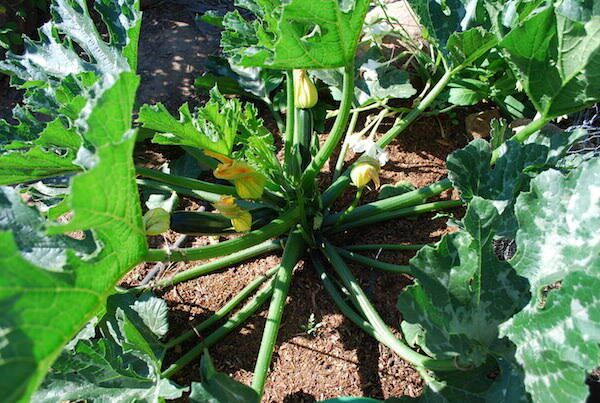 When planting zucchini, 2 plants will produce more than enough zucchini for a family of 4. If your family really loves zucchini, and you harvest early and often, you might plant 3 plants. It’s probably better to plant a mixture of zucchini varieties, or one zucchini and one other summer squash, like patty pan or crookneck, so you have a mixture of colors, textures, and flavors. This is why it's better to buy zucchini and summer squash seeds than to buy 6-packs of zucchini seedlings at nurseries. If you buy a 6-pack of zucchini seedlings, you'll be tempted to plant them all. You'll either cram them too close together, and have sickly plants and skimpy fruit, or (more likely), you'll be swimming in zucchini, sneaking around at night surreptitiously leaving baskets of baseball-bat sized squash on neighbors' doorsteps. One of the reasons I love our seed affiliate Seeds Now is their 99 cent "Sampler Packs" that give you a few seeds of any variety to try. You can try 2 or 3 varieties for the price of a single package of seeds from another supplier, and still have seeds left over to plant the next 2 years. Zucchini seeds almost always germinate and last 3-4 years if stored cool, dry, and dark. Seeds Now seeds are all heirloom, non-GMO, and organic. Another option is to go to the nursery with a friend or two. Pick out a couple varieties of zucchini or summer squash to try, and buy 1 6-pack of each to divide among 2 or 3 friends. See Zucchini Varieties for photos, descriptions, and suggestions about which varieties to try. Harvesting Zucchini has tips on when to harvest. Interested in growing zucchini in containers? See Growing Squash in Containers. Harvest zucchini small, and frequently. 4-7” (10-18cm) is usually the best size for most kitchen uses. At this point, the skins haven’t toughened up and the seed cavities aren’t pithy. Zucchini grow amazingly quickly on a mature plant at the height of summer. A zucchini that’s 6” (15cm) long today could be 9” (23cm) long tomorrow, so when in doubt, cut it out.